Best Wedding Cakes, Cake Shop Near You! Fancy Cakes by Leslie, Serving Maryland, Virginia, and Washington, D.C. Fancy Cakes by Leslie is an award-winning, family-owned cake designer located in Bethesda, Maryland, and has the best event cakes in the entire Washington, D.C. metro area. All of our cakes are made with love and from scratch, right in house! We design wedding cakes, groom's cakes, birthday cakes, graduation cakes, children's cakes, sports cakes, cupcakes and cookies, with both buttercream and fondant designs. We service a wide region, including Alexandria, Arlington, and Northern Virginia, as well as Annapolis, Frederick, and Baltimore, Maryland, and can deliver as well. We also host decorating classes and birthday parties!. Fancy Cakes by Leslie has been successfully treating customers to edible works of art for 22 years! 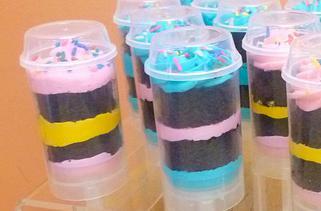 It all began with DC native, founder, owner, and designer/cake decorator, Leslie Poyourow. Leslie's wedding cakes, birthday cakes, party cakes, and cupcakes are award-winning creations that have earned her national and local praise, from the Today Show, where Leslie was chosen as the winner of the "Hometown Wedding," to Washingtonian Magazine and dozens more in between. With pastries that please the palette, delightfully decadent desserts and cupcakes confections crafted from all natural ingredients, Leslie has used her passion to create edible visions and delicious conversation pieces. Fancy Cakes by Leslie is located on Bethesda Row at 4939 Elm Street. In 2009, Fancy Cakes by Leslie moved from the Kentlands to its current home on Elm Street in the heart of New Bethesda. With window displays featuring whimsical seasonal cake masterpieces, daily passersby are drawn into the bakery where they are greeted by an unparalleled aroma -- everything from baking chocolate chip "Man Cookies" to nutella meringues. In the "just-in-case," at the front of the store, customers can purchase "emergency cakes" and mini-cakes without having to worry about pre-ordering. There, too, those in need of an emergency treat can find delectable cake pops, masterfully adorned cupcakes, and a variety of delectable baked goods. Fancy Cakes by Leslie is consistently voted "One of the Best for Wedding Cakes" By Washingtonian Magazine, and has been the Top Vote Getter for eight-years running, 2006, 2007, 2008, 2009, 2010, 2011, 2012, & 2013. Leslie was additionally featured on TLC's hit reality show "Ultimate Cake-Off" and was featured twice on Foot Network's "Ace of Cakes." Leslie was selected by The Washington Post as a Top Cake Designer in Washington, DC, was featured on Oxygen Network's "Real Weddings from the Knot" in and crafted the winning cake the Today Show "Hometown Wedding." 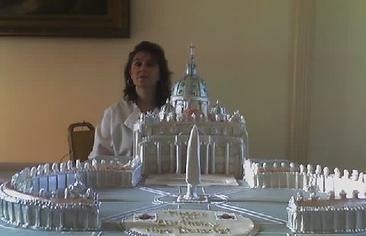 With global reputation that precedes her, Leslie was chosen to design a cake for Pop Benedict XVI's 81st birthday at the Vatican Embassy. Popular "Inside-the-Beltway" and out, Fancy Cakes was commissioned to create a cake for Hillary Clinton's mother's 90th birthday as well as unique cakes for JLo and Marc Anthony, Mike Tyson's daughter, baseball great Tommy Lasorda, Caroline Kennedy, Eva Longoria, and, from coast to coast, thousands of others. Leslie on delivery at the Vatican Embassy for the Pope's birthday celebration. He love's chocolate cake! In 2015 Fancy Cakes by Leslie was honored to be a contestant on CAKE WARS... the wonderful Hello Kitty Episode filmed in California. Upon returning from that filming Leslie began filming a new show for the Cooking Channel called Cake Hunters which aired in the Spring of 2016. Another honor was making a cake for Sasha Obama's birthday. We appreciate all of our experiences and, most of all, our customers! Of course, we could not do everything without our staff! Fancy Cakes by Leslie's customers can peer inside the kitchen where a team of dedicated and talented bakers and decorators help build our creations. From 7-tiered wedding cakes garlanded with delicate handmade flowers, to corporate cupcake towers fitted with logos and QR codes, children and adults alike gaze wide-eyed at the internal workings of Leslie's talented staff. 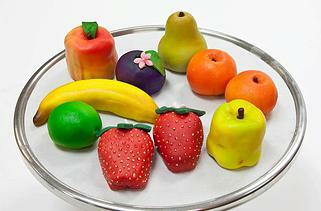 Beautifully handmade marzipan at Fancy Cakes by Leslie. Though not widely known, daily Fancy Cakes by Leslie takes goods from their raw state and converts them into a finished product, a process that has earned her the valued title of Manufacturing Plant where quality control is paramount. Proud to use the freshest, most natural ingredients, Fancy Cakes by Leslie almost magically transforms a simple egg, sifted flour and granulated sugar into a tour de force of the grandest proportions. Her cakes are all unique and never mass-produced. Specializing in creating realistic looking sugar-flowers, Leslie often adorns her cakes with edible paints, bows and lace. A native Washingtonian, Leslie graduated from the University of Maryland where she studied business and then went on to a career in Federal Marketing. With a need to satisfy her creative instincts, Leslie took classes in cake design taught by Collette Peters at the Confectionary Arts School of Ewald Notter, one of the world's most prestigious sugar and chocolate schools. In 1996, Leslie merged her creative talents with her business acumen and opened her dream-come-true, Fancy Cakes by Leslie. Find your fancy cake, cupcake and a variety of other treats at ..
4939 Elm Street in Bethesda, Maryland or call (301) 652-9390 to set up an appointment. Our infamous crab basket created for the Today Show Wedding. Jlo and Mark Anthony at the W-Hotel in DC for Mark's birthday celebration.